Let's get one thing out of the way now — calling these guys EDGAY is neither funny nor clever, and anyone who does it in the comments field owes me a beer of my choice. I know, you know, and they know that "EDGUY" is the stupidest band name since DUMPY'S RUSTY NUTS. But seriously — behave, jackasses. Actually, given these guys' propensity for cornball humor and hideous album covers (see above), it's hard not to form an opinion of them before hearing a note of their music. Thankfully, "Rocket Ride" is a much more enjoyable affair than one might think, although the band's swaggering, unrepentant mix of AOR and power metal is about as unfashionable as it gets. EDGUY basically distill a Who's Who of Eurometal influences past and present, from HELLOWEEN to PRETTY MAIDS to EUROPE, and add both a quirky sense of humor and an unswerving sense of what makes a song memorable. From the surprisingly heavy opener, "Sacrifice", to power metal exercise "Rocket Ride", to obligatory ballad "Save Me", EDGUY deliver strength and consistency, and make it look easy. It's easy to miss the level of quality here simply because the band is so good at what they do — they push all the right buttons, and while the whole thing may be formulaic, they pull influence from enough styles to make the record satisfying anyway. 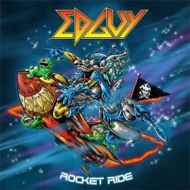 Put simply, EDGUY are not innovators, but they're top-notch artisans, and on "Rocket Ride" they deliver a damn good time. It's an enjoyable, satisfying album for anyone into the lighter side of power metal, or for those seeking a meatier, more substantive take on the AOR/hard rock sound. Whether you find their dorkbrained sense of humor hilarious or irritating, there's no denying that EDGUY deliver the goods.